One of the most common complaints of pet parents is that their cats or dogs are disruptive or destructive when left alone. 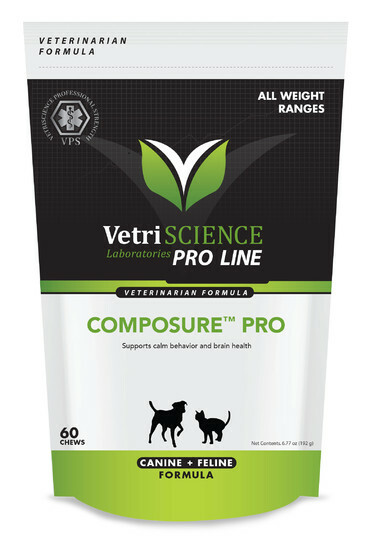 By giving pets Composure™ Pro before leaving the house, pet owners can help alleviate anxiety-related behavior in pets without affecting the animal?s energy or personality. 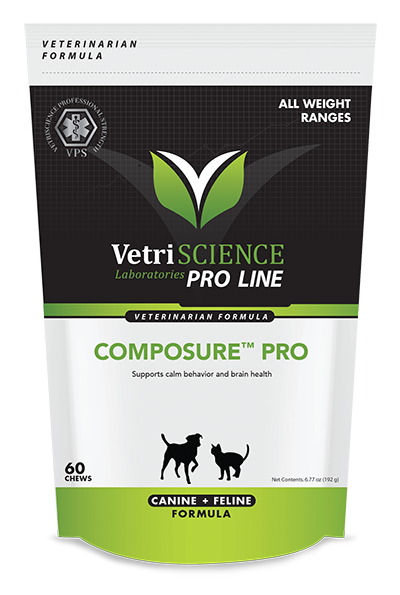 Composure Pro contains ingredients proven to support calm behavior during exposure to environmental stressors. The C3 (Colostrum Calming Complex) is a mixture of active bioactive proteins that is produced from a special microfiltration process of certified bovine colostrum. C3 Complex provides molecular precursors that support the calming response by normalizing cognitive and brain functions that are associated with excessive brain activity. L-Theanine (Suntheanine® Brand) is the patented dietary supplement for stress reduction and relaxation. Product can be given up to two times daily or on an as needed basis. It is safe to double in times of increased stress.